PIN - SARAH COVENTRY. "FLEURETTE" FROM 1974. 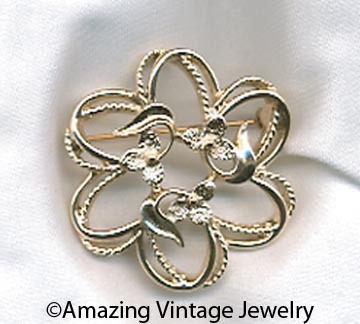 GOLDTONE OPEN-WORK SWIRLS WITH FLORAL ACCENTS. 1 5/8" IN DIAMETER. EXCELLENT CONDITION IN THE ORIGINAL BOX.